Is it only me that connects the blood on his hand with a girls period? OMG LIGHT I KNEW YOU DID SOMTHING WITH L!!!! YOU CAN'T SPEND MONTHS CHAINED TO A GUY WITHOUT DOING SOMTHING!!! 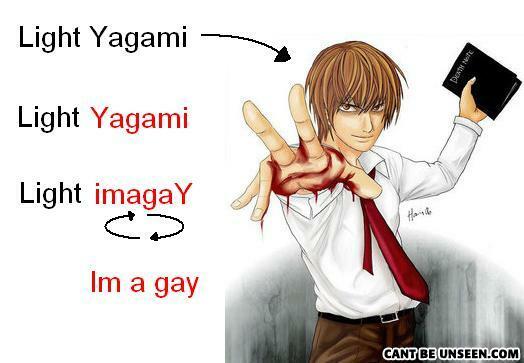 "ynop yagami= im a gay pony". Yeah, except nobody is called ynop. Or Hsif either. 1. Make Cross 2. Nail a guy to it 3. Get an audience 4. ???? 5. PROPHET!!! a girls period? as opposed to a mans period?